Google Chrome is a web browser developed by Google. It is fast and supposed to be stable. Sulav came to live support yesterday reporting that Google Chrome stopped working. All he got was a popup saying “The application failed to initialize properly (0xc0000142). Click on OK to terminate the application.” You might also get another error code which is (0xc0000005). Reinstalling the latest Google Chrome did not solve the problem. Did a little research and found that there is a known problem caused by Symantec product but Sulav is using Avast Antivirus. Fortunately I’ve managed to find workarounds to stop Google Chrome from crashing whenever its being ran. There are two workarounds to this Google Chrome crashing problem. You can either use the --no-sandbox or --in-process-plugins switch when launching Google Chrome. Both should fix the crashing problem but there is a huge difference between this 2 switches as each has its own pros and cons, so you should decide yourself which option is more important for you. By default Google Chrome enables Sandbox security. It is designed to prevent malware from getting installed on the system. Using the --no-sandbox option leaves your computer more vulnerable to flaws or security exploits on those pages. This switch is more suitable for those tech savvy people who don’t need to rely on antivirus program to keep their computer from being infected by computer viruses. As for the --in-process-plugins, by default, Chrome runs plug-ins in separate processes from the browser itself. An advantage of doing this is if a plug-in crashes, it won’t cause the entire browser to crash. So the --in-process-plugins switch tells Chrome to run plug-ins in the same process as the browser. This switch is more suitable for users who is not able to determine if the website they visiting is dangerous or not. Now you understand which switch to use, here is how to run Google Chrome with these switches. 1. Make sure you close all running programs. 2. 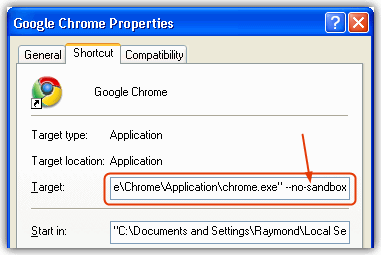 Right click on the Google Chrome icon at your desktop or Start Menu and select Properties. 3. Go to the Shortcut tab if you’re not already there, add the switch at the end of the target. By default the last character is double quote, so you’ll need to add a space then followed by --no-sandbox OR --in-process-plugins. Do take note that there is two dashes. 4. Now run Google Chrome as normal. You won’t see the 0xc0000142 or 0xc0000005 crash popup anymore. What really caused the 0xc0000142 crash on Google Chrome? I really have no idea because I couldn’t find anything on it and I am a full time Firefox user. Hi … it happened with me and also I have Avast so I think that the problem is the antivirus … and now it happening to other programs , the same message too like ACDsee and Flash player. it would be nice if would help. helped me after a lot of efforts! i used it but it showed that i am using an unsupported command-line flag: –no-sandbox. Stability and security will suffer. Anyway to remove the message? I had a virus infestation that I used MalwareBytes, Avira, Kaspersky and Hitman Pro on. Hitman Pro came up with 1 thing that none of the others did but it couldn’t fix it on its own. And the Kaspersky tool that said it could, couldn’t. So here are the details. 1) After running Hitman Pro I discovered that I had the Alureon Rootkit living in WS2IFSL.SYS file, located in C:\WINDOWS\system32\drivers. 2) So I went to my original Windows XP CD and copied the WS2IFSL.SY_ file to the C:\WINDOWS\system32\drivers folder. 3) I then deleted the current WS2IFSL.SYS file and renamed WS2IFSL.SY_ to WS2IFSL.SYS. I’s working like a charm…thanks man. Bravo…It works ..thanks man !! Doing this has just opened a security hole in your OS. Sandbox is VITAL to protect your Google Chrome against hackers. Be careful! Thanks very much, This fixed my problem you are the best and should consider a job with goggle. Very good trick.. Many user have such problem Spread as much as possible this trick thanks……. Thanks very much, your suggestion fixed my problem on the first try. Cài và test trên máy khác ok hết. Bác nào giúp em nhé! This error is in result of a trojan that somehow got to my comp. Avast warned me about it (gave me the delete option), I deleted it and as a result, chrome gives me that error. It would make no sense to give the -no-sandbox command if there is a code injected into chrome. it would just give the trojan the “OK” to go crazy. Watch out for the cause of this error first! Thanks man, i just got those error messages in chrome, opened firefox and searched google, read ur article and did as u said and man, my prob is gone, thanks bro. My error is that whenever i install google chrome it works fine after installation and i continue to work but if i restart my computer and launch chrome it does not start. i click on the icon and nothing happens, even if i go to its directory and launch from there it still does not work. does any one have a clue on whats going on and what do i have to do to get it working without reinstalling it all the time. please help. i have not installed google chrome IE bt still have this error wenever i start my pc. –in-process-plugins solved the issue . I had same error but after some dinging i find other solution, there is version of virus that insert code in Chrome file and with that code visit web pages and download other viruses and blocking work of Chrome. Trick is to go in Chrome install folder example C:\\Documents and Settings\\User\\Local Settings\\Application Data\\Google\\Chrome\\Application\\1.0.154.53\\Resources\\Inspector ( make backup copy of Inspector file) and open inspector document with notepad and delete rows that have …….jl.chura.pl……….. (try typing ura in notepad search because virus puts @%& or something else betvin c and ura ) in my case i had 5 rows of that code and they were the same that is how you can recognize or maybe other version like goasi.cn Last thing of good Chrome code is …..class=\”status-bar-item\”> it is end of 5 row, everything after that you can delete. When you done click save. Reopen after that and if code is back you did not delete all try with search an delete what is left. I repeat that this is solution if virus mess up with your Chrome code. Hope it will help somebody. I never get this error so far. Also Google Chrome sometimes closed itself. Hi Raymond. I also used Google Chrome for some time and it crashed constantly. My friends told me to use SRware Iron which is a german-made clone of Google Chrome with improved features and it works perfectly, never had a single problem since installing it. Thanks ray! I’d always used chrome as my browser coz i dont have enough memory to run firefox nor ie so this solution would be a big help for me! by the way i’d like to use your live help but i dont know what is the number to call or how can i contact you to ask for live help. Ive just downloaded the application for live help. Yay for firefox! I honestly really really hate Google Chrome. Just a faster version of IE to me :/. Then again Google Chrome IS better than IE so I wont compare them to be the same.